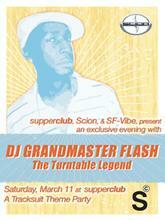 It’s cool to know that as we’re listening to a compilation of Grandmaster Flash, Melle Mel and the Furious Five here at home, DJ Grandmaster Flash is at SupperClub tonight, literally just down the street a half a block away on Harrison! He’ll be on the turntables starting in one hour – at 12:30 AM. Go check it, yo.